February 2, 2017 12:55 am / 2 Comments on Sinner or Opportunist? It’s really the weather’s fault. Here in the Queen City, our winters are mild, but still cold. In January, typical highs are around 50F, and lows are around 30F. Not this year. Yes, we DID have that cold snap the first weekend of the month that brought highs in the 30’s for three days, accompanied by a little sleet and snow. But the rest of the month . . . The girl in the middle of the picture lands near the entrance, her baskets loaded with bright yellow pollen. And here is where I may have slipped into sin . . . January is normally a pretty solidly cold month, and you have to get into February to get a few days around 60F or so to allow you to open up your hives for an inspection. Well, this year, January afforded more options than February normally would. What to do?!? Crack the propolis seals between the boxes to get a glimpse of the inner activity, knowing that more cold weather is almost assuredly on its way? Such a decision would surely be foolhardy and injurious to the bees. But the decision was not that simple. This fall was relatively warm, and now a March/April-like January . 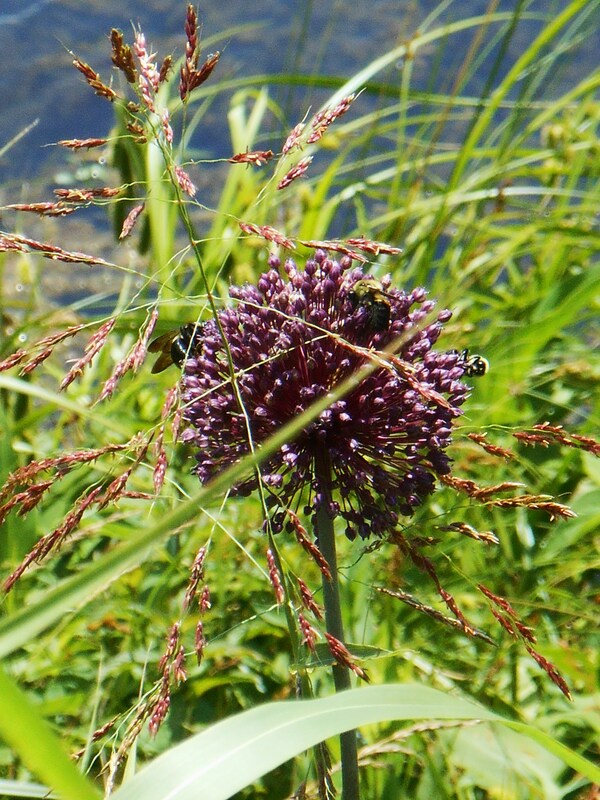 . . what if the bee populations are rebounding quickly? Could we see early swarming? Shouldn’t I get an idea of what the girls are doing, so I can take actions to encourage them to stay home? As I said, the decision wasn’t an easy one, but I decided to take a chance, and opened up hives, not once, but twice! The first time, during the second full week of January, my foray into the hives was more tenuous. I only removed the top cover and a few frames in the top box in most of the hives. But I had an opportunity to see something I’d never seen before. Instead of being centered on the frame, the brood was centered on the bottom front corner of the one to three frames with brood in each hive. It was amazing how consistent this was between the fourteen surviving hives. (Two hives were dead, and a third was queenless.) And hive configuration didn’t matter (we have double ten frame deep, single ten frame deep, and double nuc deep configurations in our beeyards). The only variation was the location of the frames in the hive, with most on one side or the other, and a couple near the center of the hive. Most were in the bottom, but a few hives had the brood in the top box. When one very active hive was opened, the burr comb split open, spilling honey that the girls quickly worked to salvage. A second look the last week of January showed rapidly expanding brood populations. (Perhaps too rapid. I fear that the return of cold weather, predicted for much of early February, may find some hives with too few adult bees present to keep ALL of the brood warm. We may see some chilled brood over the next few weeks.) Any hive that had only one box, or where the brood was in the top box, was building burr comb between the top bars of the frames in the top box and the solid inner cover. (They wouldn’t normally do that, but this year I experimented with putting shims under the inner covers to allow easy addition of pollen patties and other solid feeds for the girls, unintentionally providing enough space to encourage them to build comb when they were ready.) One hive already had larva in the burr comb (how were they planning on keeping it warm? ), while another had filled theirs with honey. But most of the burr comb remained attached to the bottom of the solid inner cover. Like that left in the hive, this was filled with honey, which the bees quickly lapped up to return to its rightful home. It was time to make adjustments. Here are some of the things I did . . . Combined the queenless (single deep) hive with a weaker, but still viable, single deep hive. Any single deep ten frame hive that had built burr comb (come to think of it, that was all of them) had a second box added. One was so strong, that I added its second box early. Lo and behold, when I checked it again a week later, it has already added brood to two frames in the top box. One of the two hives that was given custody of a pair of supers. The other is at Nuthill Farms. 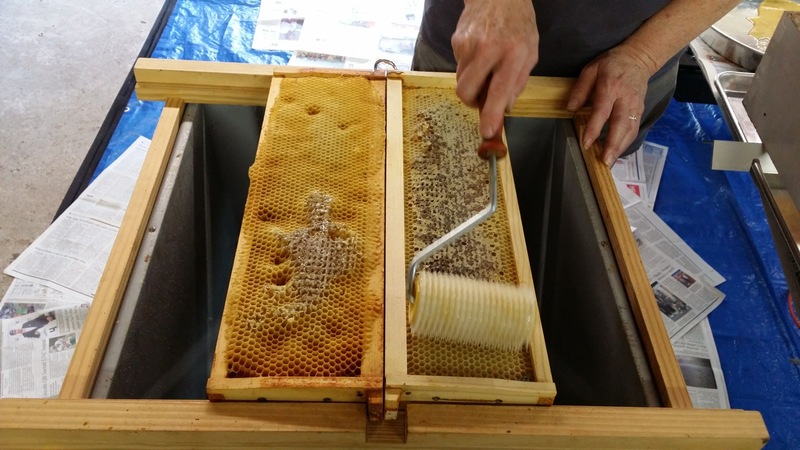 Two of the double deep ten frame hives had brood in both boxes and had built burr comb, one filling their burr comb with drone brood, and the other with honey. A sign they were already looking for extra space. I can’t believe I did this in January! I put a queen excluder and a pair of empty supers on top of each. I swapped boxes on hives that had brood only in the top box, providing them an opportunity to expand upward (which is the bees favorite winter movement). So tell me . . . do you think I was a sinner or an opportunist? The reality is, we can’t really know until another opportunity to look in those hives is available a few weeks from now. So stay tuned to our little blog. I will post a followup. It was a beautiful cool morning, with an easy breeze moving through the pavilion. We were booth #2 in the “Greenery Shed”, a location that contained a variety of vendors, although the focus was supposed to be on plants. Our location made us one of the first booths people would see as they entered the Greenery Shed. We were also right next to the concession area, so people seeking a snack as they spent their morning at the Charlotte Regional Farmers’ Market would often spot us, and come over to talk when they finished their snack. Others were content to sit on the nearby benches and listen to us talking to our booth’s visitors. 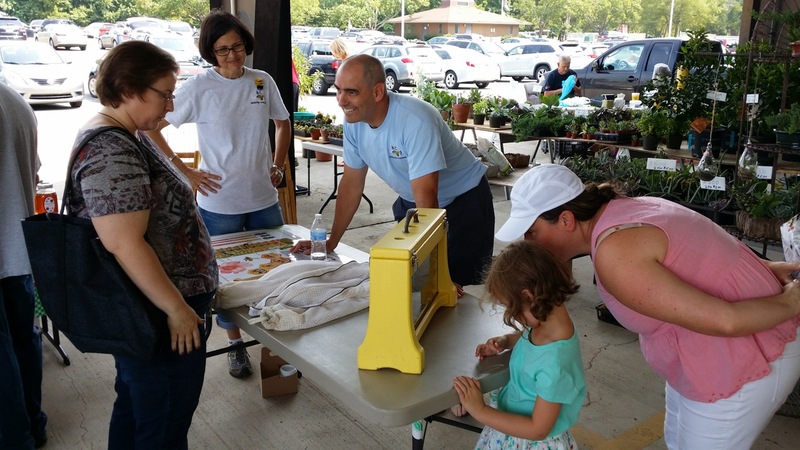 Less than a couple of weeks earlier, our local bee association president called us and asked if we would be willing to coordinate a booth for National Honey Bee Day (August 15) at the Regional Farmers’ Market. We discussed it briefly, consulted the Lord, and called Gerry back with a “yes.” He sent us contact info for the Farmers’ Market and some club member phone numbers, and off we went. 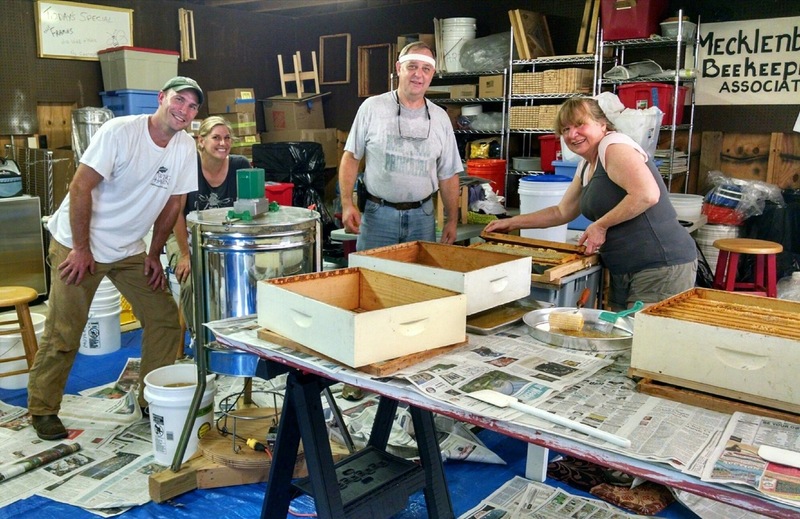 Our most pressing priority was to recruit other beekeepers to work with us. Some as expected, were busy. But others were available, and were willing to graciously offer their Saturday morning to work with us. We ended up with four really great folks who are all good beekeepers and enthusiastic about sharing their love for the girls: Melinda and Todd, Karen, and David. 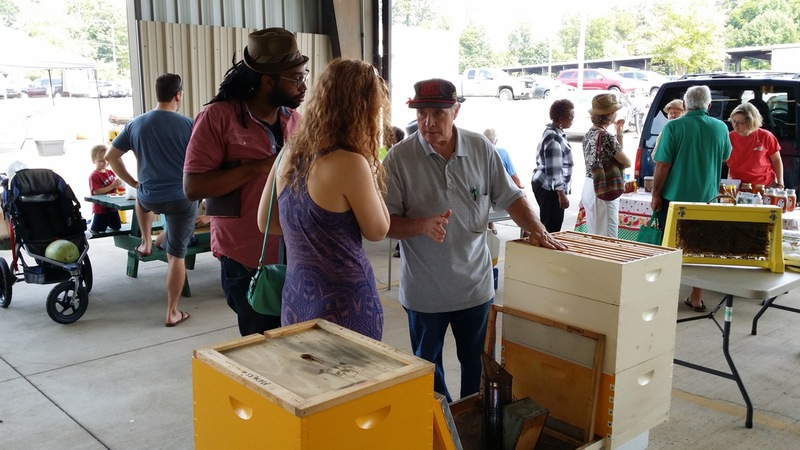 At the same time we were exchanging phone calls and e-mails with our fellow beekeepers, we got in touch with the lady who manages the farmers’ market, Amie Newsome. Amie was very enthusiastic. She wanted us to set up an educational booth in the same location used in the spring by the Master Gardener’s for their informational booth. 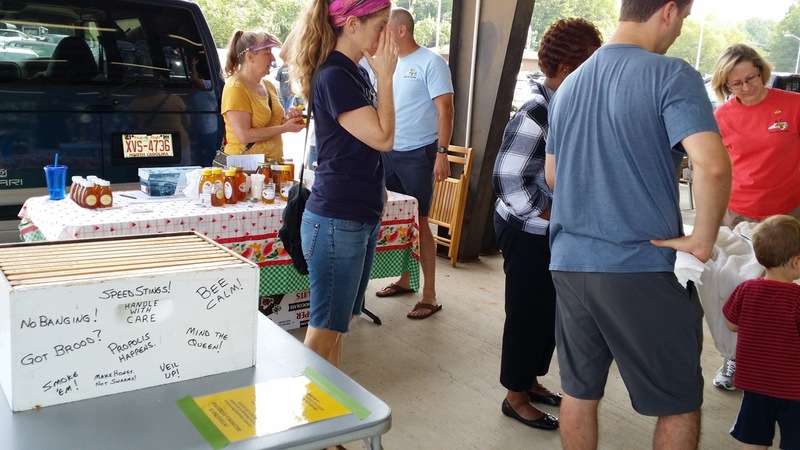 She was hoping to use a “scavenger hunt” to show how important bees are to the many different products sold by the vendors there at the Farmers’ Market. 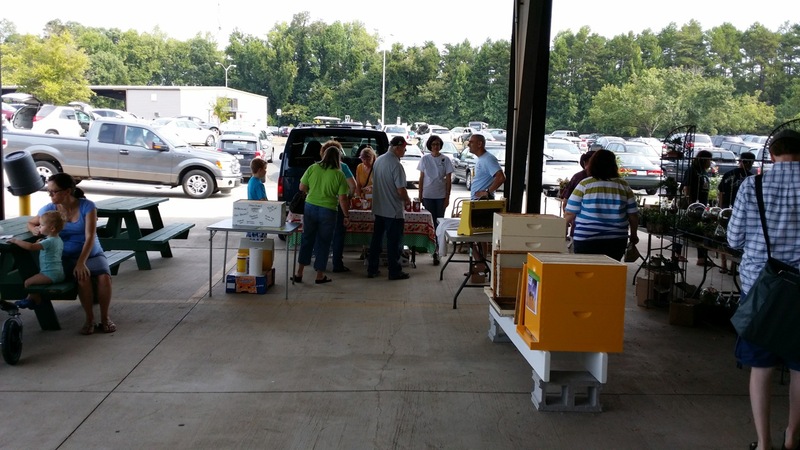 This is what we saw the day we stopped into meet with Amie Newsome about setting up the beekeeping educational both at the Charlotte Regional Farmers’ Market. We visited the booth location with her, and realized that it was MUCH larger than what we were accustomed to. To effectively use it, we would have to supply more than just a couple of tables with an observation hive and the club’s teaching hive. In addition, Amie shared that, on a typical Saturday, approximately 2500 cars arrive at the market between 8 am and noon. This meant we could potentially have a large crowd visiting us. It would be better to have a larger variety of things for them to look at so we didn’t have people impatiently waiting to look at just a couple of things. We, and a couple of others working the booth, produce small amounts of honey that we sell to the public, and were interested in selling honey as part of our informational activities. This was a concern for Amie for two very good reasons: She didn’t want the honey sales to detract from the informational nature of the booth, and she felt that our sale of honey would be unfair to the two beekeepers who were regular vendors at the the Farmers’ Market. We understood her concerns. First, we assured her that we would set up, and man, the booth so that it de-emphasized the honey sales. Second, we agreed to pay the one day rental fee, and sign the paperwork, to allow us to sell honey as a vendor the one day we would be there. In the end, I think that arrangement was a win-win for both us and Amie. This was the booth on Saturday after we set it up. 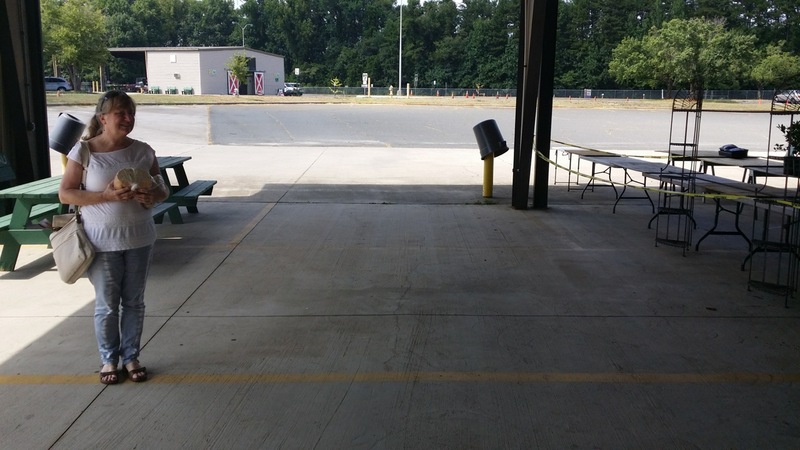 We were flanked on the left with picnic tables folks could sit at while they ate food they’d purchased in the consignment area. On our right was a vendor who sold all sorts of beautiful plants and pots. The hive stand was set up closest to the aisle on the right hand side, with the observation hive table next to it. The card table with the teaching hive was on the left, and the honey sales table was furthest away from the aisle. Our van was parked behind the honey sales table. It’s bumper became a convenient bench for the ladies to use when desired. We turned our attention next to how we would be setting up the booth. 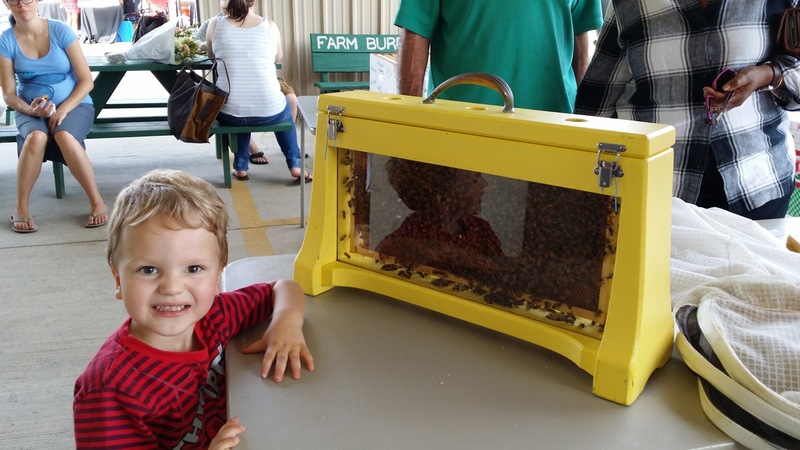 First, there were the items the club would be providing: A display table, observation hive (we had to supply the bees), teaching hive and club banner. (But somehow, in the process of transferring the equipment to our van, Gerry and I forgot the banner . . .) But what else would we put in this large 13′ x 24′ booth? Fortunately, the timing of this display couldn’t have been better from an equipment availability standpoint. We had a new hive that was freshly built and painted that was a week away from being put into service. 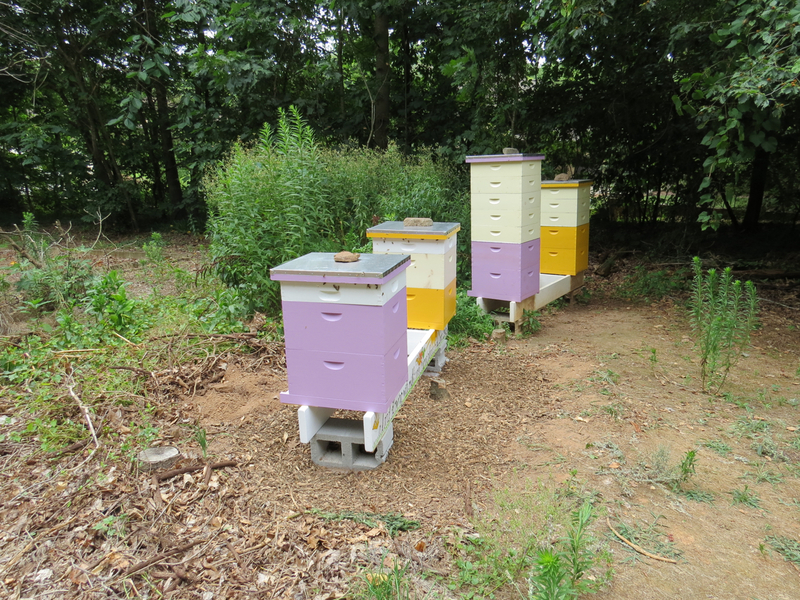 Along a similar vein we had freshly constructed frames and a new hive stand, all of which were slated for installation in another couple of weeks. There were also a number of honey supers which had been extracted, and had just recently been put into storage, as well as an old hive that was in storage until we could get around to rehabilitating it. It was 7:20 that morning when we arrived to unload the van and start setting up. Over the next 30 minutes, our other beekeeping friends arrived to help us set up and prepare for the market opening at 8 am. A couple who were very interested in becoming beekeepers listen to David as he explains the different hive components to them. 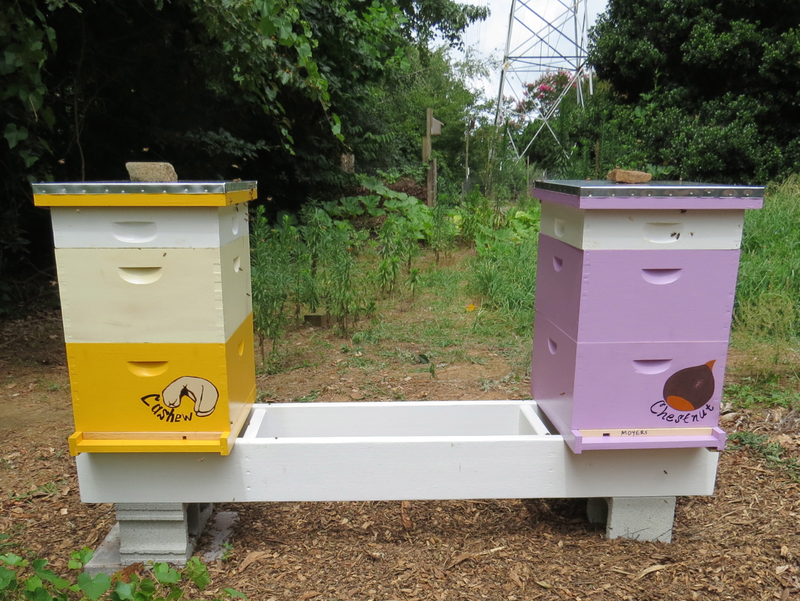 The orange hive on the left was a new hive that contained newly made frames, while the hive on the right is an older hive with a super on top. The new hive was set up for winter conditions, while the old hive was set up for summer conditions with a strong nectar flow. Things were a little slow, at first, but by 9 am, we had a strong crowd. We had placed the hive stand, with a couple of hives, closest to the main aisle. The placement worked well. The equipment is relatively large, easy to see, and slowed folks down long enough for us to engage them. Many adults, especially those who were thinking about becoming beekeepers, were intrigued by the hives. We opened them up, explained the different types of equipment and how they were utilized. One really good feature was having a new, never used hive next to an older one. We were able to show the “pristine” appearance of the internals of the new hive and contrast that with what the bees had done to the internals of the older hive. Folks were especially fascinated by the girls’ use of propolis in the hive to seal cracks, trap vermin (e.g., hive beetles), and coat the interior with an anti-bacterial layer. We explained that they did this, whether using natural or manmade hives. 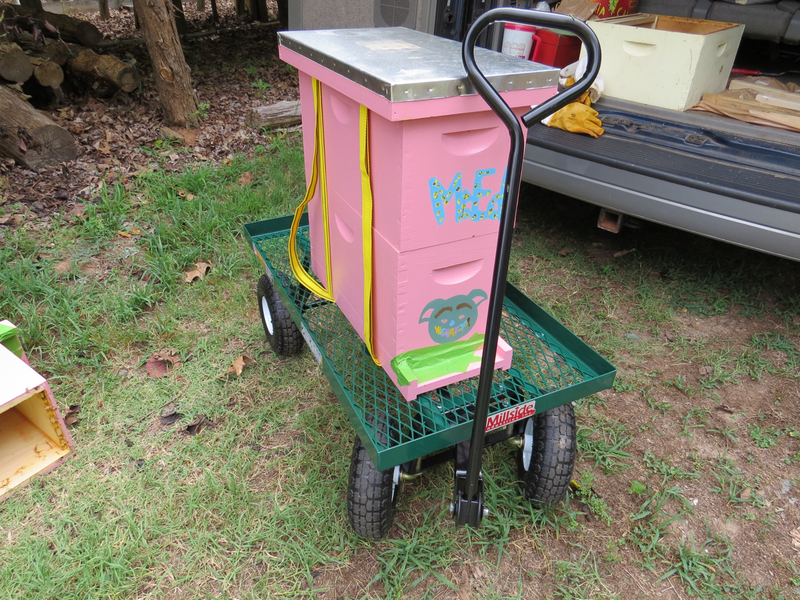 Another popular feature of the hive exhibit was the honey super. We would remove a frame, sniff the pleasing aroma of honey with a smile and a sigh of contentment, and then hold it out for the visitors to smell. They were surprised, and delighted, to find that even after extraction and cleaning by the bees, the wax retained the sweet smell of fresh honey. The kids loved watching the bees. This little fella was delighted! Next to the hive stand, away from the “madding crowd”, was a table with the observation hive. As might be expected, it was a big hit with all of the kids, and was their favorite part of the exhibit. It featured a frame filled with capped brood and a little nectar. For some reason, the girls had uncapped a few of the cells, and removed the brood for disposal. Unfortunately, there was nowhere for them to put the dead brood, so they ran around the hive, desperately seeking a hive entrance so they could dispose of the dead bodies. 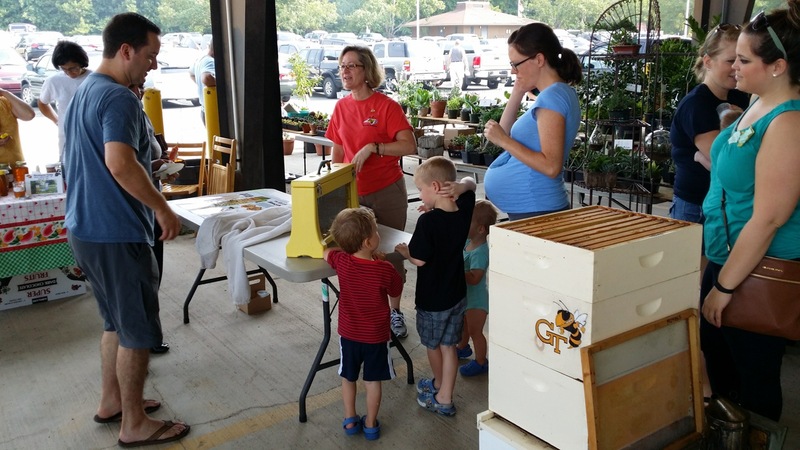 Todd and Melinda answer questions about the bees and their lifecycle while a mother and child watch the girls in action. Karen attracts a crowd as she shares her experiences with the girls. On the same table, we had a typical ventilated bee jacket (which didn’t seem to interest most folks), and a poster that shows the life cycle of the bees in their larval and pupal stages. The chart was a great tool for showing the physical differences between the various types of bees (workers vs. queens vs. drones), and illustrating their progress from egg to bee. While only a few folks perused the frames in the teaching hive, many took time to partake of the wisdom painted on its side. On the other side of the booth was a small card table with the teaching hive and a laminated information sheet about the bee association’s annual bee school. A number of folks who are interested in beekeeping took picture of the info sheet with their phones for future reference. The teaching hive–which utilizes frames with pictures of different activities and problems in the hive–was not used as much as we had envisioned. It was still quite useful, though, especially when explaining some of the problems bees encounter, such as hive beetles and varroa mites. Everyone wanted to taste the honeys! 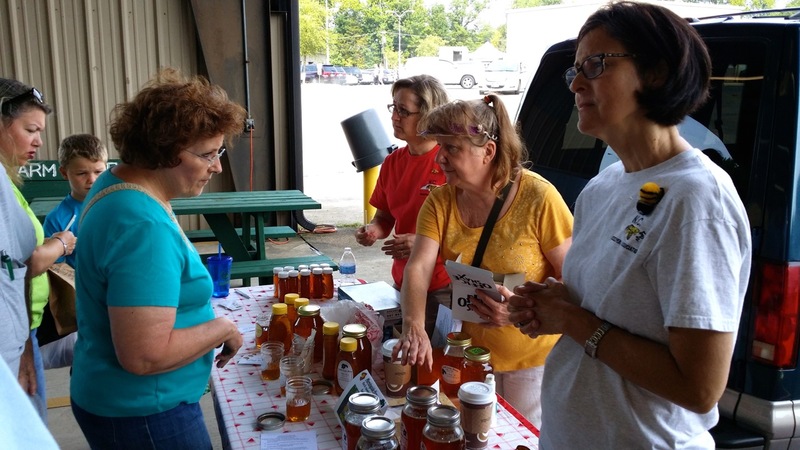 Karen (in the red), Marianne (yellow) and Melinda (grey) offer free honey tastes to our visitors, and answer their questions about the differences between the honeys. As promised to Amie, we set the honey sales table up at the back of the booth. While we were selling honey there, it was also a critical part of the teaching experience, We provided free tastings of the different types of honey we were selling. Karen had honey produced in the Ballantyne area, Todd and Melinda had honey from Providence Plantation, and we brought honey from both of our beeyards, one near Plaza-Midwood, and the other from the Weddington area. All had different flavors and colors, which intrigued folks. This provided for a discussion about differences in nectar sources, and how that could vary depending on location and time of year. A lot of folks didn’t buy our honey, but all left with a better knowledge of the factors that influence honey appearance and flavor. There was never a dull moment that morning. Many folks wandered in to learn about the bees. All in all, it was a delightful morning. The weather was sunny, but surprisingly comfortable. Thanks to the hard work and enthusiasm of our friends, David, Karen, Todd and Melinda, we were able to bless the hundreds of folks who came by and wanted to know more about honey bees and those strange folk called beekeepers who are devoted to them. We’re looking forward to more opportunities to reach out to the public in the future. Now that we’ve had several opportunities to bottle our honey, and have gotten proficient at it, we saw our honey bottling operation a week and a half ago as a non-event. Well, even the best laid plans of mice and men . . .
We had just completed bottling honey from Nuthill Farms, and were starting to set up to bottle honey from our Morningside apiary when it happened . . . The lights flickered off, the refrigerator compressor went silent, and a couple of devices with battery back up beeped loudly to inform us of their dire straits. I walked out to see if something had happened to our line when our next door neighbor drove up, clearly shaken. She said that her car (which had the top down, and was carrying two or three children) was barely missed by a power pole struck by a police car that lost control as it conducted a high speed chase down Central Ave. The whole street (and probably many others) was without power. This picture, which was taken without flash, shows the lighting condition we had with the Coleman lantern. But this was before we peeled off a couple of sections to locate in other parts of the kitchen. 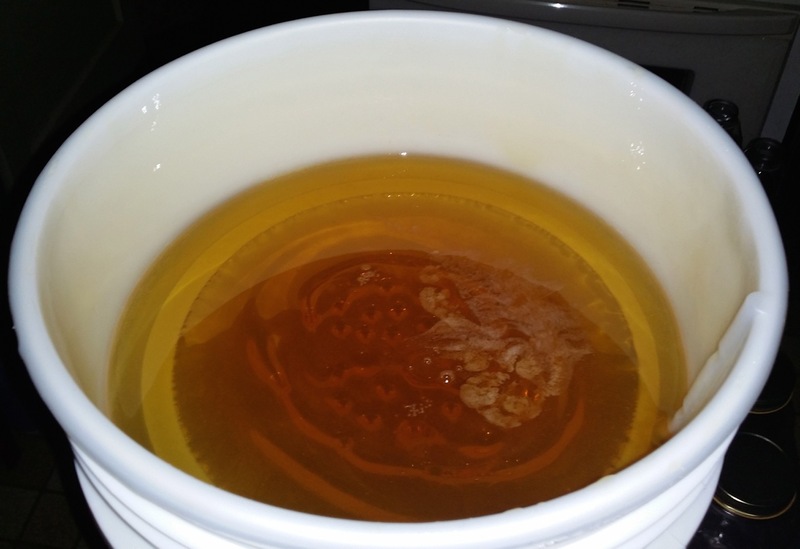 One of the first things we did when we got started was to pour the honey into a filter inserted into the top of the bottling bucket to provide one more chance to remove any undesirable solids, such as wax. It was hot outside, so even with the AC off, it was cooler to stay in the house. We read for a while. But then the ants got to me. You know, the ones in my pants. 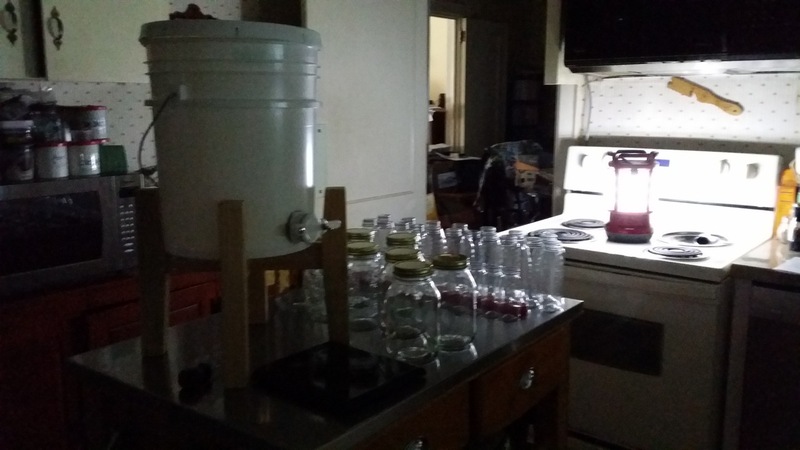 I found our Coleman lantern, turned it on, and placed it in the kitchen so I could begin setting up for our final run with the Morningside honey when the power was restored. Well, it was good and bad that I did that. It was good to be prepared for when power was restored. But it was bad for those ants in my pants. They just kept stinging me, making it impossible for me to sit back down. This picture, also taken without a flash, shows how the lighting improved when one of the sections of the lantern was moved to a different part of the kitchen. Clearly enough light to work by. The scale is battery powered, so it was not impacted by the outage. Got our power back! Now nearing the end of the bottling, we had to completely open the honey gate to get flow into the bottle. You can actually see the surface of the honey in the bottling bucket. I should probably explain here that our Coleman lantern is not the traditional propane-fueled model. Rather, it is a true 21st century LED model that was gifted to us a few years back by a good friend. This means it’s battery powered, and has a unique feature where four smaller lights can be peeled from the base unit–which stores the eight D-cell batteries that provide the main power. The four smaller pieces each have a rechargeable lithium ion battery, that is charged from the main batteries in the base unit. So I removed a couple of the smaller units, and located them strategically around the kitchen, leaving the main unit to sit on the range. While this wasn’t as ideal as our normal lighting condition, it was sufficient. So, resume bottling we did! Well, I have to give Duke credit, they outperformed their time estimate. It was around 6:30 pm when the lights flickered back on. We had completed bottling the quart jars, and were just about to start on the 1 lb. squeeze bottles. So we completed our bottling in “normal” light. Fortunately, we were able to label our bottles in full light the next day. Gracious, I have enough trouble in good light getting the labels on straight! I can’t imagine what it would be like in dim light . . .
Here’s our final product. 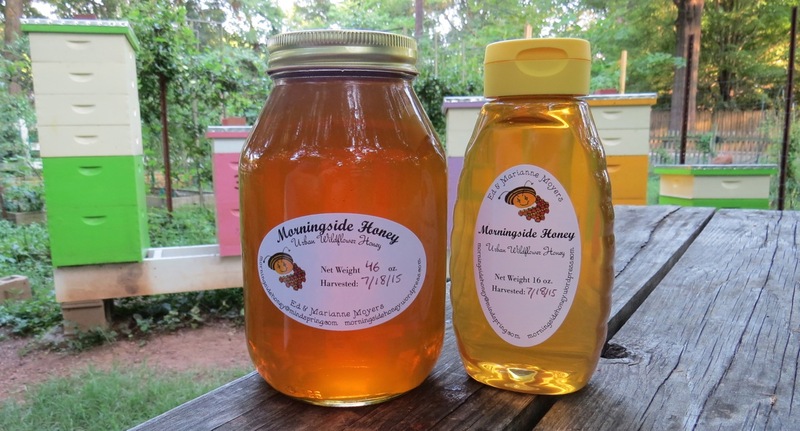 We’re blessed to be able to partner with the Morningside girls to produce this honey for the benefit of our friends, neighbors and customers. You know, it makes me appreciate my ancestors more, having experienced this. There were so many activities they had to do in their homes, which were rarely well lit. And they did them well . . . Even beekeepers, who are not considered to be particularly high tech, benefit greatly from modern technology. It was mid-July, again, time for our annual honey harvest. We had already extracted 90 lbs in May from the girls at Nuthill Farms. But early July marks the normal end of the nectar flow here in the Piedmont Carolinas, so we dutifully went through the frames at both beeyards, resulting in a total of seven supers of honey. Our bee mentors, who have a nice honey house and extraction set up, were kind enough to invite us over to use their equipment on the day after they completed their honey extraction. While the manually-driven rental extractor we can rent through the Mecklenburg County Beekeeper’s Association is very nice, you’re in a whole different league when you are able to use a motor driven extractor, and don’t have to move stuff around in your kitchen to use the extractor. 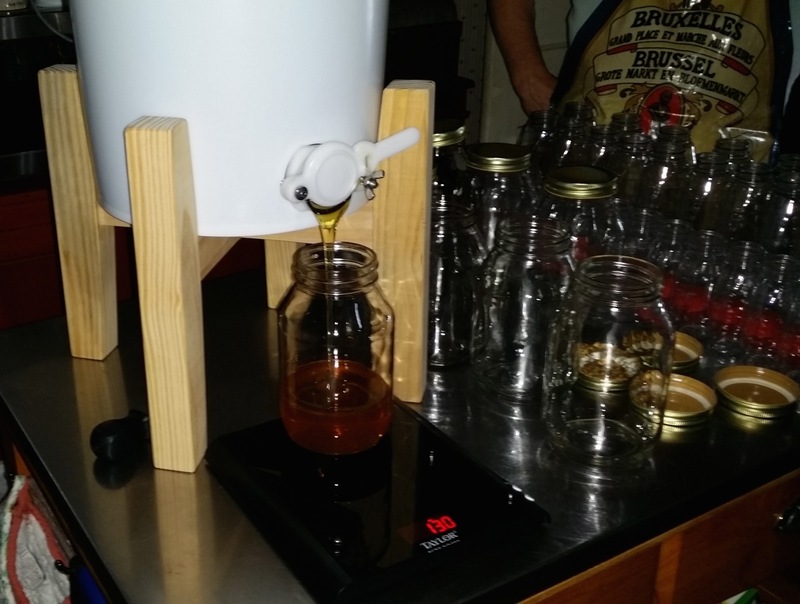 Using this equipment, we were able to extract seven supers of honey in a little less than three hours. It would take us approximately twice that long using the club’s manual extractor. What a blessing to have access to such great equipment! The following pictures and video clip give you a flavor for the setup, and how it worked. Extraction is always more fun when it’s a team effort. Our team consisted of Marianne, myself, and two folks from Wing Haven who were there to observe (our bee mentor put them to work . . .) Marianne is in the middle of flipping frames to be uncapped, while it appears that, as usual, I’m standing around trying to figure what to do. 🙂 The full super with frames waiting to be uncapped was staged on the far right. Frames are taken from there, and put on a jig over an uncapping tank. Once the frames have been uncapped, they are placed in an empty super box located over a large baking pan (directly in front of me) that captures honey drips. When the extractor is finished, extracted frames are moved into the waiting box on the front, and frames are loaded into the extractor from the box over the pan. Before extraction begins, the floor and table are covered with old, clean newspapers. If honey drips on the floor, we simply lay another newspaper over the drip to prevent honey being from being tracked all over the room. This close up shows the jig over the honey tank that holds two frames at a time. As the roller runs over the cells, it punches holes into the cappings. Usually, to effectively open all of the holes, the roller will have to be rolled several times over a frame, and may require perpendicular movements, as well, particularly in corners and other difficult to reach spots. If you can’t reach all of the cells with the punch roller uncapper, you can use a cappings scratcher to open the few that remain. After one side has been rolled, the frames are flipped over to do the other side. This very short clip gives you an idea of how fast the electric motor radial extractor spins. This is a nine frame model, and includes variable speed and bi-directional controls. If you watch the top of the picture, you’ll see our bee mentor (who was getting bored at this point) uncapping a frame. Although it started off with some up and down temperatures, spring was moving along very nicely, with local plants blooming profusely, and the girls bringing in lots of nectar and pollen. Then May hit. From a temperature standpoint, May wasn’t a bad month. But we only got 0.2 inches of rain (the average for May is 3.66 inches). 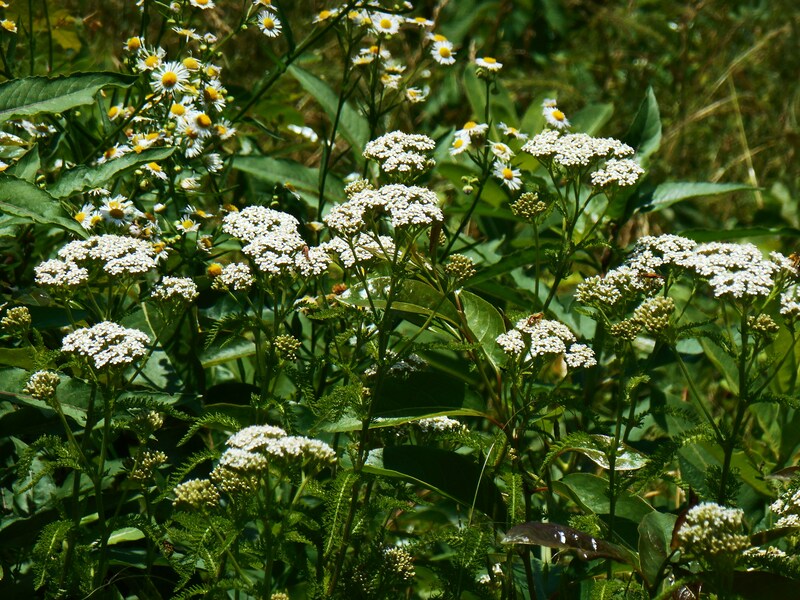 The impact wasn’t immediate, but by the end of the month, fewer plants were blooming, and the blooms weren’t as rich in nectar as they had been. Beekeepers refer to it as a nectar dearth. This table shows the monthly average rainfall in Charlotte for each month through July, and shows the actual rainfall at our Morningside beeyard for the same months. While the rainfall through April was lower than normal, it took a nosedive starting in May. It was interesting to note the difference between the two beeyards. The Nuthill Farms hives, where we harvested about 90 lbs of honey in late May, we replaced the harvested supers with new ones that had foundation only frames. This was early in the drought, and we were optimistic that the rain would return, and the Nuthill girls would resume aggressive comb-building activites. That didn’t happen. As a result, those hives were left with a lot of frames with partially built out comb. One of the interesting dynamics we ran into when we did our main harvest on July 18, was a number of frames from those hives had 100% capped cells, but those cells only covered a portion of the frame. The rest of the frame would have a combination of bare foundation, partially built comb, or fully built comb that was completely empty. So a number of the frames we harvested from those hives were only partially filled with honey. These are a couple of partially capped frames from the Nuthill Farms hives. The top frame is mostly capped, with only a small amount of empty cells. 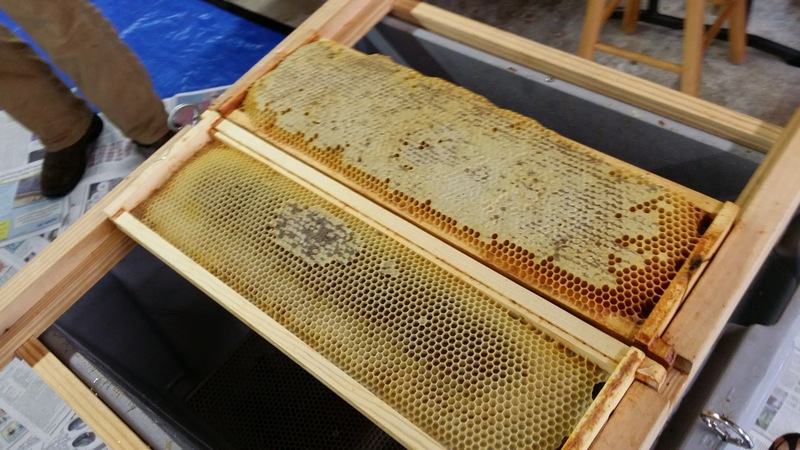 The bottom frame has only a little capped honey, and consists mostly of empty cells. The girls of Morningside were a different story. Of course, they got an unfair advantage . . . Of the six supers we placed on them, half of them were empty supers from the May honey harvest at Nuthill Farms. As a result, the vast majority of frames in their supers had completely built out comb. So all of the frames we harvested from the Morningside apiary were slap full of honey. As a result, even though we harvested one whole super more of honey from Nuthill Farms, because so many of the frames were “partials”, we only got about ten more pounds of honey from the Nuthill Farms bees than we did from the girls of Morningside. Whether this drought will continue, and if so, how it will impact the girls going into the winter will be something we will be monitoring closely over the next few months. How do you celebrate the nation’s independence? Do you march in a parade, watch fireworks, or join friends or family for grilled hamburgers and hot dogs? Well, in recognition of Independence Day, we spent our morning establishing two new sovereign queendoms–Cashew and Chestnut–in the faraway land of Nuthill Farms. Long live the queens!! This is what our approach to the Nuthill Farms hives looked like the past couple of months. Didn’t Marianne do a great job?? 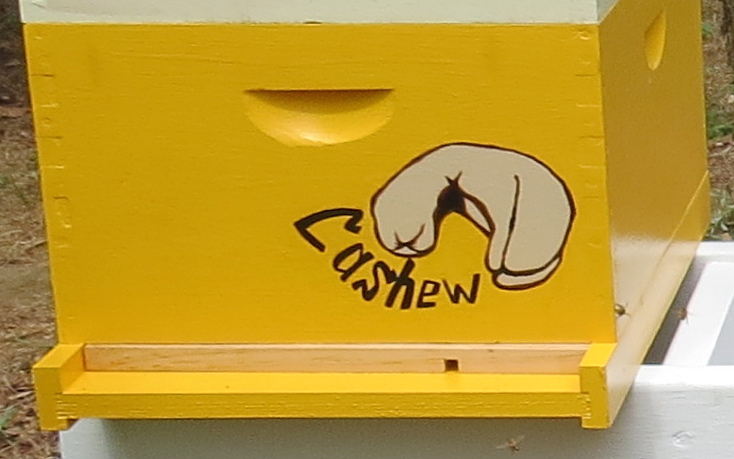 Do you think this rendering of a cashew is good enough that the girls will know we named their hive “Cashew”? By mid-June, we had five viable splits in various phases of development, including an early split from the Buckeye hive that is currently producing some honey. Two of these–in double nuc hives–were deemed to be ready for transfer to Nuthill Farms in preparation for next year. The bees were ready . . . but we weren’t. We still needed to build new frames, hive boxes and the hive stand, paint some of the equipment, and set it all up at Nuthill Farms before moving the girls there. Marianne did a great job with this hive box, too! 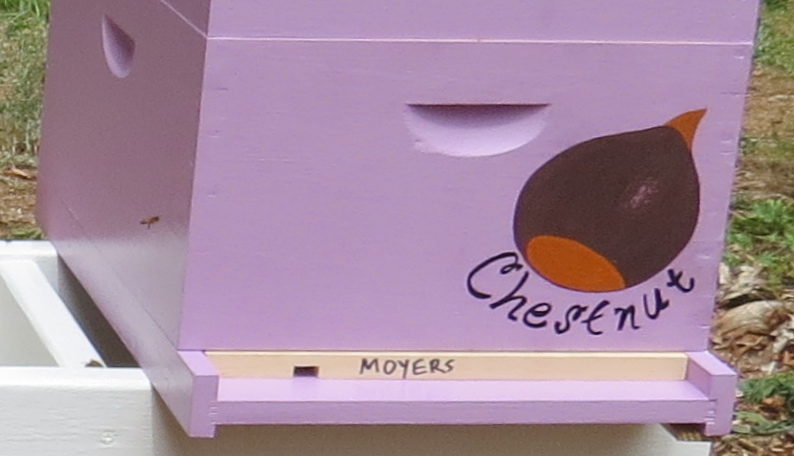 From the painting on the front of their hive, do you think the girls will know it’s named “Chestnut”? The preparations took the better part of a week, with the decorative painting of the hive stand and the hive boxes being the climactic event. Since my artistic capabilities are limited to stick figures, this was a job for Marianne. And what a fabulous job she did! The move involved a lot of time and equipment, so we decided it would be prudent to do it over a two day period, installing the hive stand and the new hive boxes on the first day, then moving the girls to their new home on the second day. 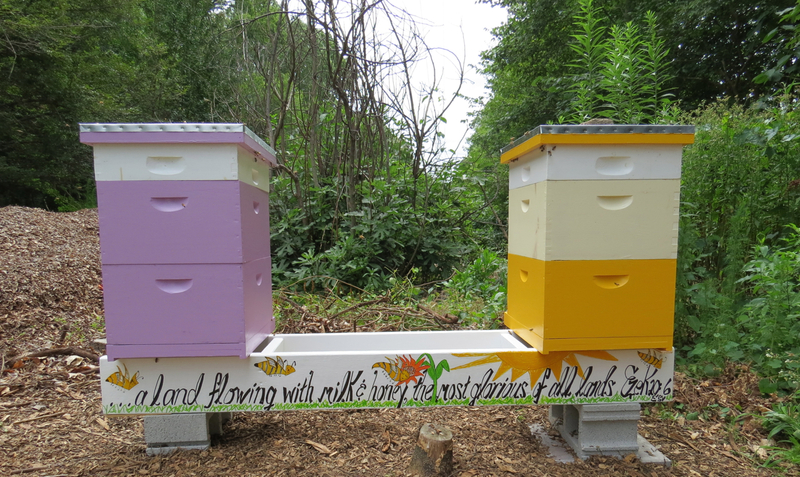 But the real work of art was this hive stand, which includes a wonderful quote from Ezekial 20:6. Marianne says the four bees are distinctly different, with a queen bee, worker bee, drone bee and baby bee. Can you tell which is which? No matter how hard I try to make all of the components square, it seems that things will still wobble, so I always keep a supply of shims I can use to eliminate the wobble. They’re cheap and easy to use. 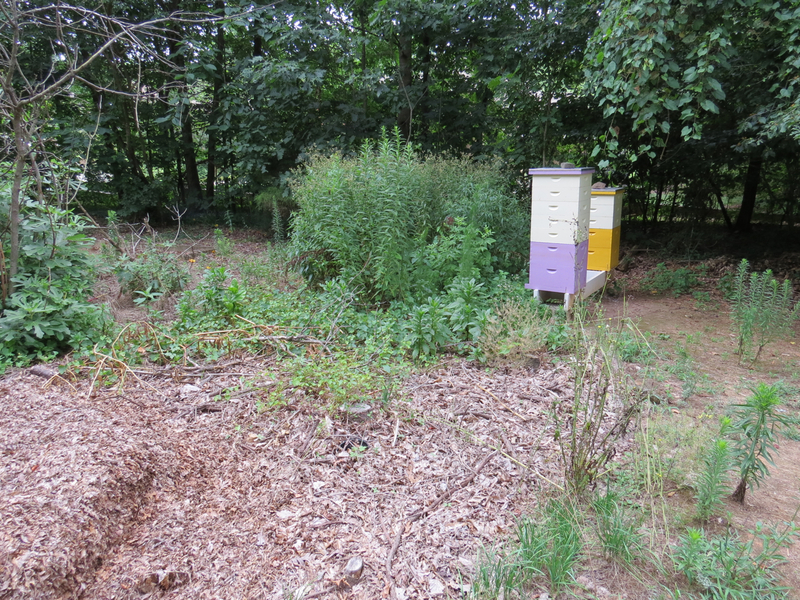 So on July 3, we packed up the van, and I headed over to Nuthill Farms to install the hive stand, along with the new hive boxes. I won’t go into all of the details of the hive stand set up, since an earlier post, A Retiring Beeyard, discusses in detail the set up of the same type of hive stand in our home apiary. The main difference between the two installations was the greater slope at Nuthill Farms. If I were to do this over again, I would have bought a third 16×16 paver, and used it to double stack pavers on the lower end of the hive stand. This would have eliminated a lot of digging, and would have kept the upper paver from essentially being underground. This picture shows what one of our double decker nucs looks like. The propolis does the real work of keeping the boxes together, but the straps provide an extra measure to keep the hive together in the event of a spill. Notice how the entrance is taped shut. And isn’t that a great little cart? I purchased it to help with this move, but see that it will also be VERY helpful moving larger hives AND heavy honey supers for harvesting. It’s rated weight capacity is 800 lbs, which is way more than I will ever be able to load on it. The next day–July 4, Independence Day–was the big day: Moving the girls from their small nuc homes to their new independent queendoms in the fair land of Nuthill Farms. The evening before, I removed the top feeders from the double nucs, and put the moving straps around them. Early that morning, I sealed the entrances with Frog tape, and loaded the girls into the van for transport to their new home. Then began the slow process of converting two small 10-frame hives into two full-size 18-frame double deep hives (we use 10-frame deep boxes with nine frames per box). Rather than stick all of the frames from the double nucs into a single 10-frame deep box, we concentrated them in the bottom box, and put a few in the top box, filling in with new foundation-only frames. 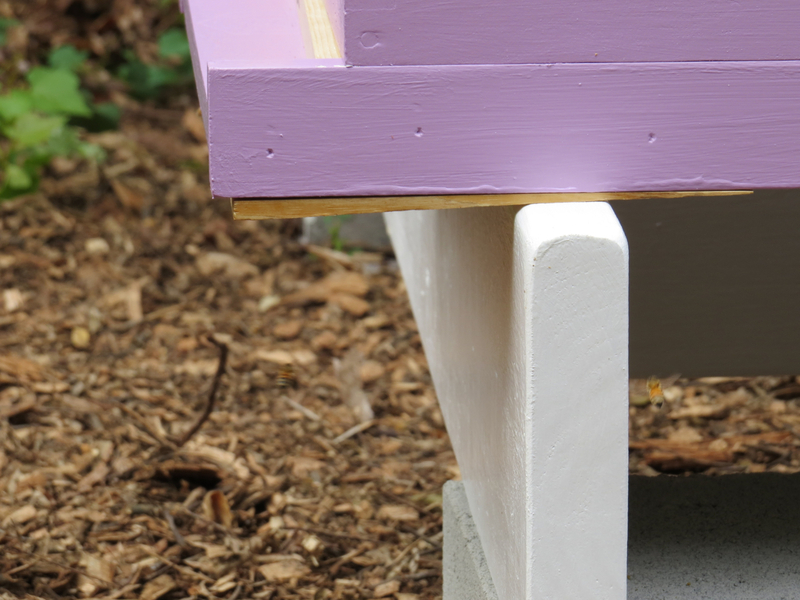 Because of information we’ve gleaned from the bee journals, we placed foundation-only frames above frames with brood, because this supposedly encourages the bees to build out the comb on those new frames as quickly as possible. 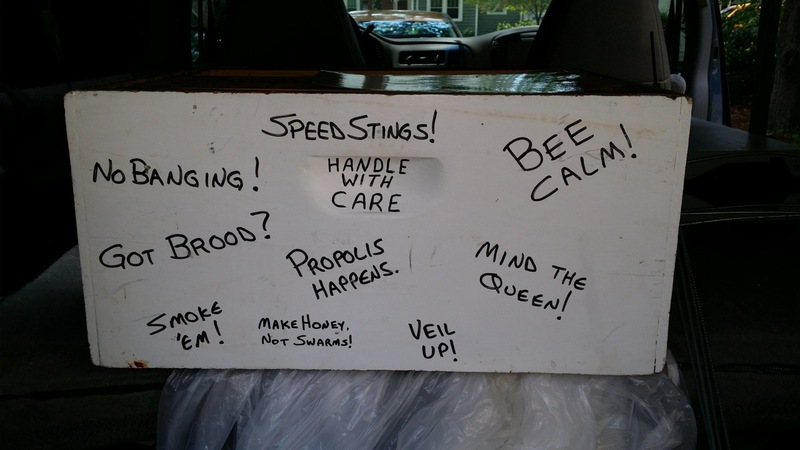 The girls also went from being mere numbers (we number our nuc boxes) to mature hives with their own special names. The girls were generally calm through all of this, but became a bit cranky towards the end. This is understandable. After all, not only were we uprooting them from the familiar surroundings around our home, but they were getting new homes with their furniture (frames) totally rearranged. You can see the results in the following pictures. I wonder if the girls will be shooting off fireworks on Independence Day, next year, to celebrate the anniversary of the founding of their new queendoms? P.S. For those of you who follow this blog, I owe all of you a big apology. I have not posted anything about our girls or the garden since February. I plan to write a number of posts in the coming weeks to fill in the gap. So you will likely see a mix of posts about current activities and events from earlier this year. Hope they won’t be too confusing . . . This is the front of Cashew and Chestnut hives. While the little stylized paintings are cute, they also serve the very practical purpose of helping the bees differentiate between hives. This is the final view of Cashew & Chestnut hives from the rear. This is what we see every time we come out to work with the bees, since we always work from the back of the hives. This is what our approach to the Nuthill Farms hives looks like, now. 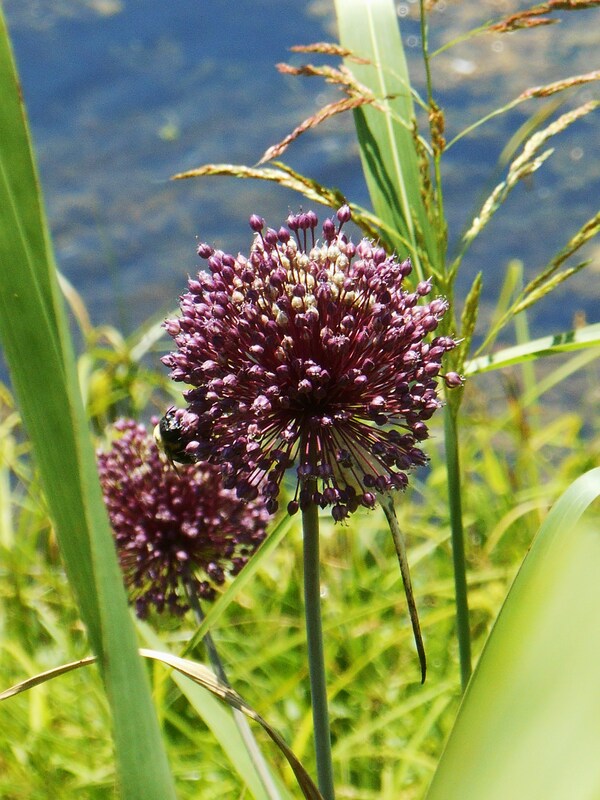 What a wonderful way to spend a hot summer day: Watching the bees as they flit from one bloom to another, busily acquiring nectar and pollen for their nestmates . . .